Unfortunately now the stupid draw has lessened chances of Greenwood making his debut this season. Haha yeah. He might rest De Gea. I don't watch youth team so who is our biggest talent? Chong, Gomes or Greenwood? Greenwood, closely followed by Gomes. Then perhaps Chong. Though only perhaps. About 2 yrs ago the answer would have been Gomes, no question. He has been someone people have been talking about for 5 yrs or so. He always stood out because his technique is lovely. That part of his game is still excellent. He has had a harder time making an impact with the U-23s. That's the next step for him to take, to make a difference. Having said that it does appears we are trying to change him from a No.10 to a No.8, more of a controller. I am open to corrections as I follow the youngsters but not as much as others. Now its Greenwood no question. I have never seen a player so two footed. I believe Dembele is someone equally two footed. U18s has been too easy for him this year. Has a had a couple of chances with U-23s in the last month or so, still adjusting to it. Gomes struggled to adapt last season but he’s been our best player in the u23s this year. I watched some videos of him. Looks great. But is he no9 or no10 or winger? He is all over the pitch . ST primarily, he drops deep a lot if he's not getting the ball. I think he's played at number 10 before and we've used him on the wings a bit recently, he sometimes switches during games, a bit like how our current first team front 3 do. He is none of those IMO. He is a modern day forward. Has the pace/two footedness to play wide, but has the finishing of a striker. What I think most of us are masturbating over is an interchanging front 3 of Martial/Marcus/Mason. Fair enough. Still has not stood out as much as expected, no? But perhaps thats a function of his role as a No.6. You are right. No.8 is what I mean, as the controller in the midfield. Angel has pretty much exclusively played as a 10 or out left for thr u23s. Not as a 6 or an 8. That's what I was thinking. I even went on Transfermarkt to check where they thought he had played (they aren't 100% reliable on formations). We have used Hamilton + Garner, Hamilton + Whelan, for most games. The main reason DJ Buffonge got dropped was so that Angel Gomes could play as a no 10. The only two PL2 U23 games that I can find in which you might generously describe Angel as having played as a no 8 are Newcastle and Fulham, two games we lost. We used Whelan + Barlow in those matches, so you could perhaps view Barlow and Gomes as both playing as no 8s. At U19 level this season there would be a stronger case for claiming Angel played more as a no 8 in some games. 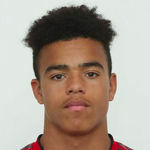 Greenwood is quite clearly a star player at U18 and U19 level. At U23 level he has started 3 games, scoring one goal (that a PL standard keeper may well have saved). Based on his performances to date for the U23s, it would be surprising to rush him into the first team ahead of genuine first team players. The standard of football at U23 level is very low; somewhere between midtable League Two and National League, at a guess. Gomes is probably a star player for our U23 side but wouldn't be considered one of the top performers in the division. We are currently the 2nd lowest scorers out of 12 teams, in 6th place in the table. Clearly there is a Sbragia effect but even still, neither Gomes nor Chong have done much this season that would indicate a readiness to perform at PL level. Angel has started 11 games this season in PL2 U23. In 3 games he played wide left. In 6 games he played as a no 10. In two games you might have a case for claiming his role as being one of two no 8s, ahead of Whelan. I know the lad's still young and has time to develop but he keeps getting injured at times when he should be making an appearance in the first team. It's this kind of luck that you need to go your way if you're ever going to make it at United. If players stay fit for the rest of the season and we strengthen in the summer in his position, it's hard to say when he will get a mention in the first team again. I just hope he can keep making waves in the reserves and get some first team football before the season is out, like Rashford did. I'm not surprised the way the opposition kick the crap out of him every game. Anyway it's just purely bad timing. He's fit most the time, little niggles happen especially with people growing. Agreed. I just hope this doesn't keep happening when he would have got a game in the first team. Chances like this happen for youth players when there's a need for it and don't come around often unless you're Messi reincarnate. Come on. The lad is 17. It'll likely be two more years before he's really ready to step up to the first team permanently. By then we should have sold Lukaku which would mean more opportunities for Greenwood provided we don't sign anyone else. Honestly he wouldn't have played today anyway, making your debut away to Chelsea isn't the best idea. I think next season we will start to break him in. Anyone know how long he's out for? If he's back soon, he could be getting a chance with all the other injuries. Injured at the wrong time. Maybe on the bench v Palace ?? He missed the U18 game this weekend so he’s presumably still injured. He wouldn't play for the u18s. He would have likely played for the u23s on Monday. Hey Mase, what ya doing Weds? Ah didn’t realise they were playing on Monday. Anyone have any info on his injury, is he out for long? Came here to ask the same question - surely someone has info? Darn shame he got injured as he most likely would have been given some minutes. Going off the OGS press conferences, it sounds like something minor rather than a medium to long term injury. Yep. That's where you need luck to make it at United. Hopefully he is too talented to need luck. Rashford actually got his start because Keane got injured, sometimes the stars just have to align.